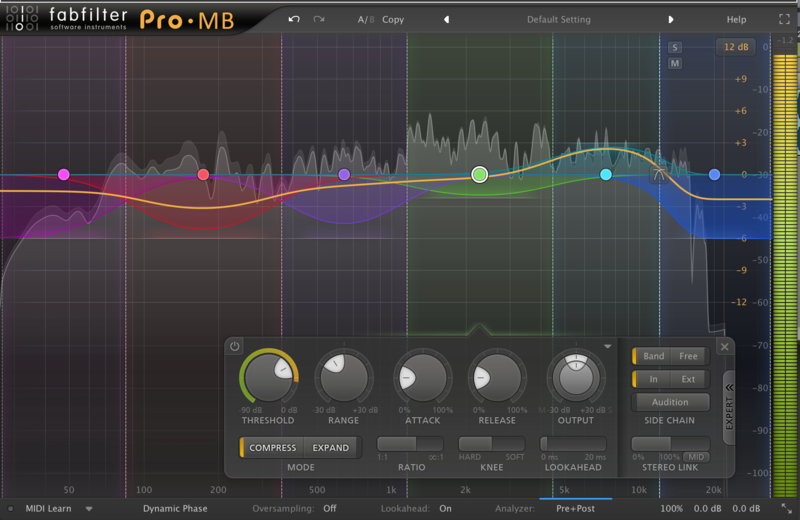 In general, I liked this plug-in in spite of some issues I discovered. Regroover does pretty much what it says on the tin. It can provide up to six split layers of analyzed material, separating the source into individual components as well as a container for 16 triggerable expansion pads. 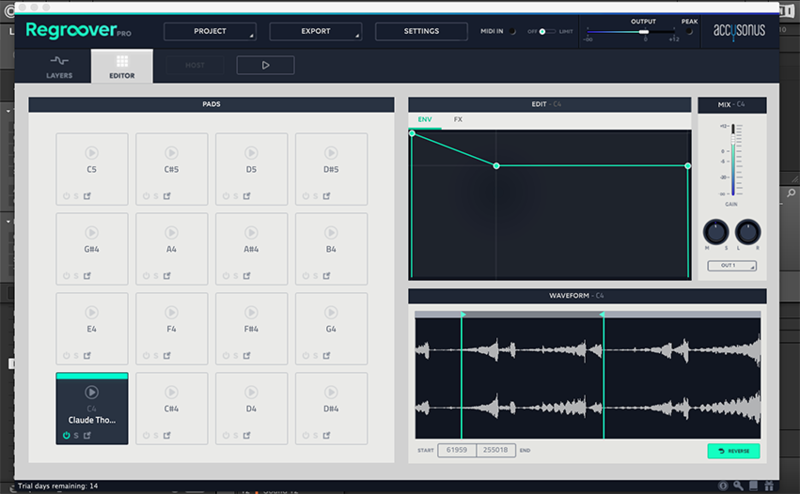 This plug-in is primarily for drums. 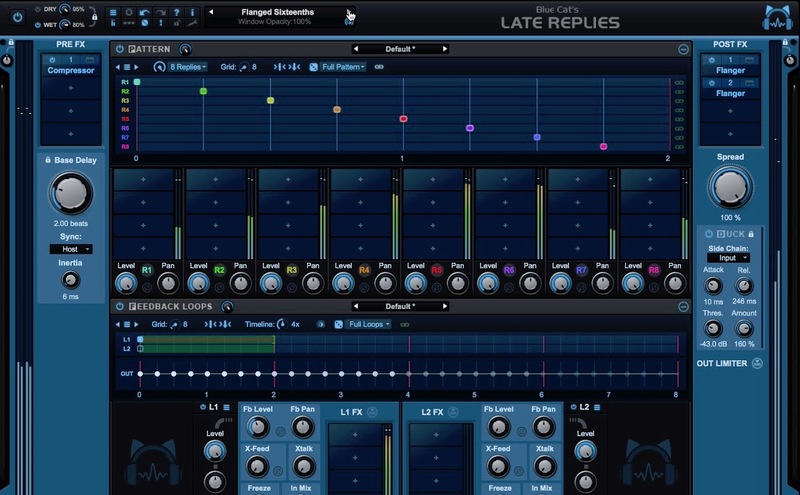 Materials with other sustain-y musical elements such as bass synth or guitar or pads will create unexpected results, which may or may not be useful. It really depends on how you view and manipulate the results of non-drum loop material. Drums are its forte. Works quite well with Cubase 9.5. on a Mac running 10.11. No installation or activation issues and most importantly: no blacklisting. The plug-in has a very low CPU footprint. Jumping between Cubase and the Regroover UI for transport control works fairly* seamlessly. Tormenting the UI constantly doesn’t hiccup Cubase or crash it. A very robust plug-in, overall. The controls and GUI elements mentioned in the manual perform as defined without issue. Nothing unusual about the parameters or choices of parameters. No surprises here. The composite playback of the split layers is quite good. When sync’d simultaneously against the source loop, there is some minor “phasey” delay (expected because of processing round trip) but when A/B’d, I couldn’t really detect any artifacts introduced from the process. I appreciated the BPM tempo warning. Handy anti-gotcha feature. Dragging a loop into its window initiates an analysis determined by two controls: Layers and Activity (for adjusting the analysis to simple to complex material). By default, it will split a loop into four layers. It can be re-analyzed to add up to two more layers. 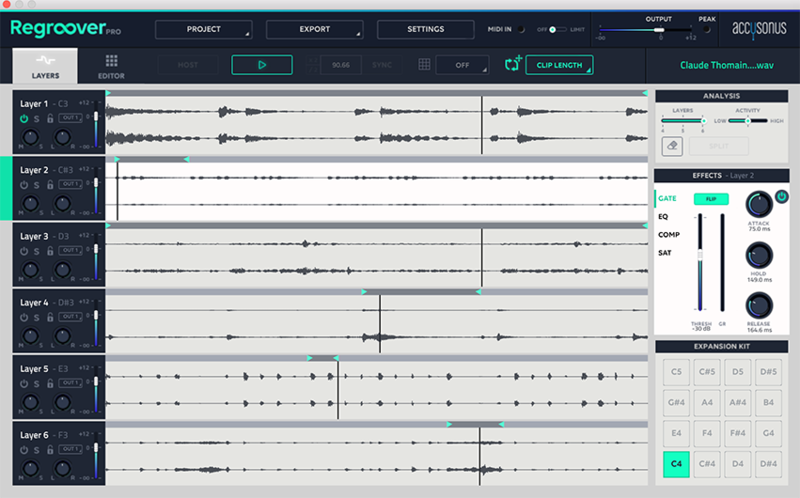 The analysis takes its best guess on what gets placed on a layer and for most common drum loop material, it makes the right choices. 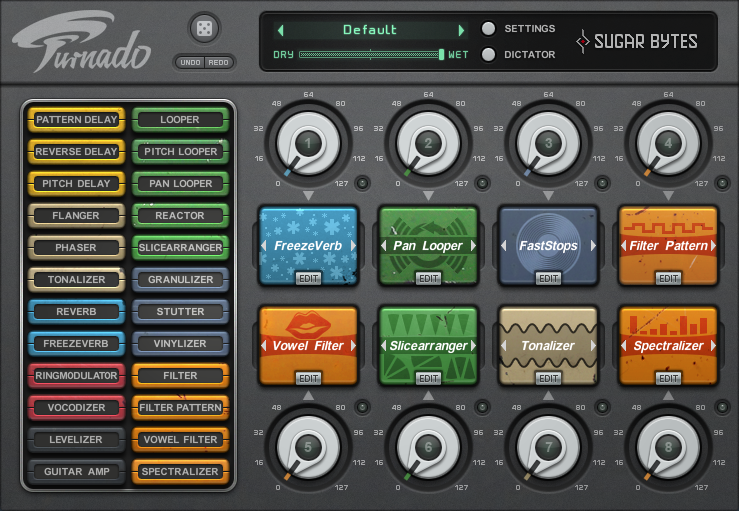 Control over the Layers includes an On/Off button, Solo, an M/S control, Gain, Pan and Output Routing. 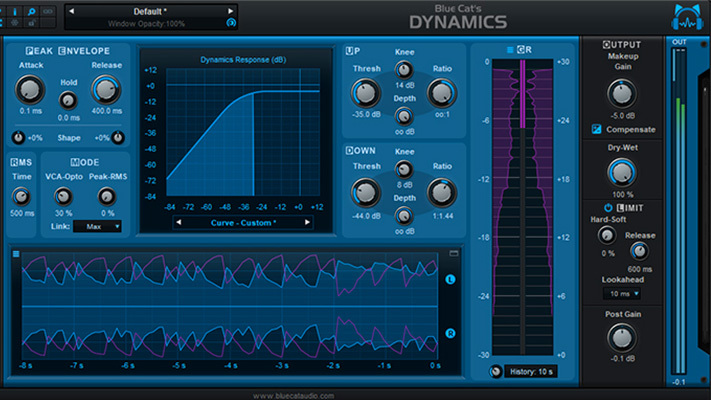 Additionally, there is an Effects section, providing Gate, EQ, Compressor and Saturator controls. While fairly minimal, they do a good job with no surprises. Regroover also incorporates a 16 pad Expansion Kit interface that permits individual samples or selected Layer regions assigned to them, to be MIDI triggered along with the analyzed loop elements. On a troublesome vocal track, where I had all but given up on compression to even it out (resorting to painstaking gain riding automation), I inserted the Vocal Compressor. It took all of about 30 seconds to finally get that track to sit perfectly in the mix. After the loop is split, it can be “regrooved” by setting Layer Markers along the timeline for each Layer lane. Great for mashing it up or simply reducing a large loop to a smaller segment. There is also an Annotation Tool that can “erase” selected sections of layers. More on this later. No value indication or text entry for adjusting controls in Layers. It was impossible to change something like pan or volume. No apparent “0” or Default reset for controls. Ditto for Pad Edit controls. Contextual Help not available for all GUI objects. Had no idea the manual was downloadable from the button on the bottom. There was no overall GUI element guide in the manual to identify its functionality. Layer Volume control window seems to be set too wide, making it easy to accidentally change the volume. Soloing a layer doesn’t mute Expansion Kit Pad sounds. Actually, found this frustrating. The available grid resolutions are dependent on length of the imported audio clip. Don’t know why this limitation is in place. The Annotation tool doesn’t work as expected when attempting to move annotated material to a new Layer. Regardless of whether other tracks are locked, the entire clip is reanalyzed and all the layers are changed from what was originally on them before annotating. I may be misunderstanding how this is supposed to work…but my gut says the results are not intuitive. What I was expecting is that Annotation would automatically create a new layer made from the selections, leaving the source layer intact, minus the selections. It does not seem to do that here. It does remove the material (as expected) but does not automatically create a new layer for the removed material. Locking all the other layers, then adding an extra layer and invoking Split after annotated selection does add a new Layer but only after completely changing the material on all the other locked tracks. This really seemed like a bug to me. I found that when initially sync’ing up, Regoover doesn’t recognize where the hosts loop markers are. You need to set the host to loop at bar 1. This was a gotcha…but no biggie. Once I adjusted everything to my liking, all the layers and Expansion pads could be MIDI triggered anywhere along the hosts timeline. I felt something about this should have been mentioned in the manual. Pitch control for the pads. Curve adjustment for Pad ADSR envelope slopes. Currently linear only. Double click on a populated pad to reveal the Pad editor. Solo or mute pads from main interface Expansion Pad view. Mute for Pad edit view. Velocity sensitivity control for Pads. 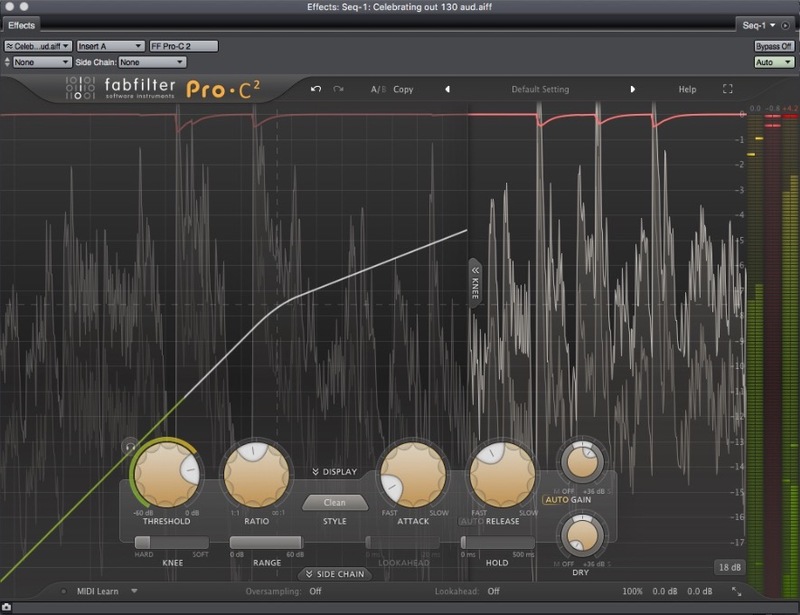 The ability to increase the size and resolution of the Layers editing waveform for more accurate Annotation editing. Option for soloing Layers and/or Pads to be cumulative rather than radio button style. Contextual Help available for all GUI elements and controls. At least 8 layers instead of 6. Some percussion/drumkit combos could really benefit from this. A little more leeway for the Activity control. There is no middle ground between the 3 selections of Low, center and High. Either that or turn slider into buttons so there is no mistaking 3 choices only. 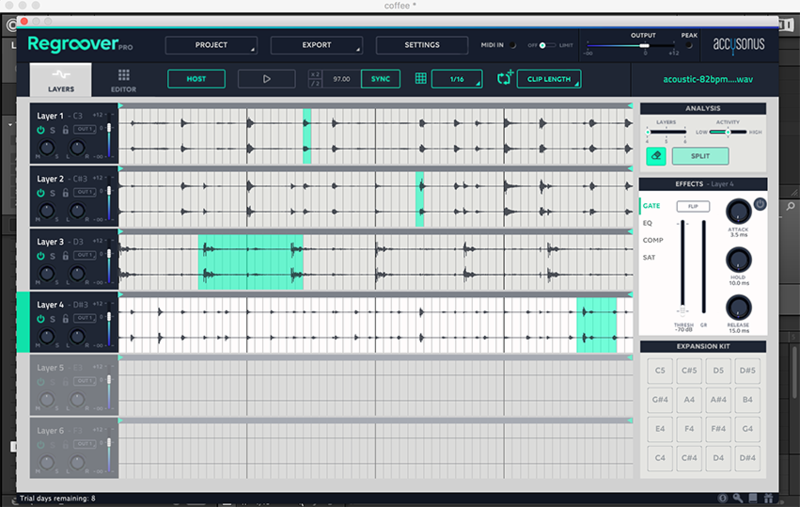 The ability to drag a Layer lane directly as a MIDI file onto a DAW MIDI track. From the second paragraph of Getting into it: Wish there was some way to offset where Regroover starts in relation to the host. It appears that the analyzed loop start point must start at the host’s bar 1 to stay in sync when Play is invoked. Not a biggie but noteworthy. Nitpicking aside, Regroover does what it is designed for quite well. Its ability to intelligently divide a drum loop into distinctly identifiable components without artifacts is uncanny. Using hardly any CPU to do it is a big plus. The interface, for the most part is intuitive and I found it only necessary to crack open the manual for some of the finer points. 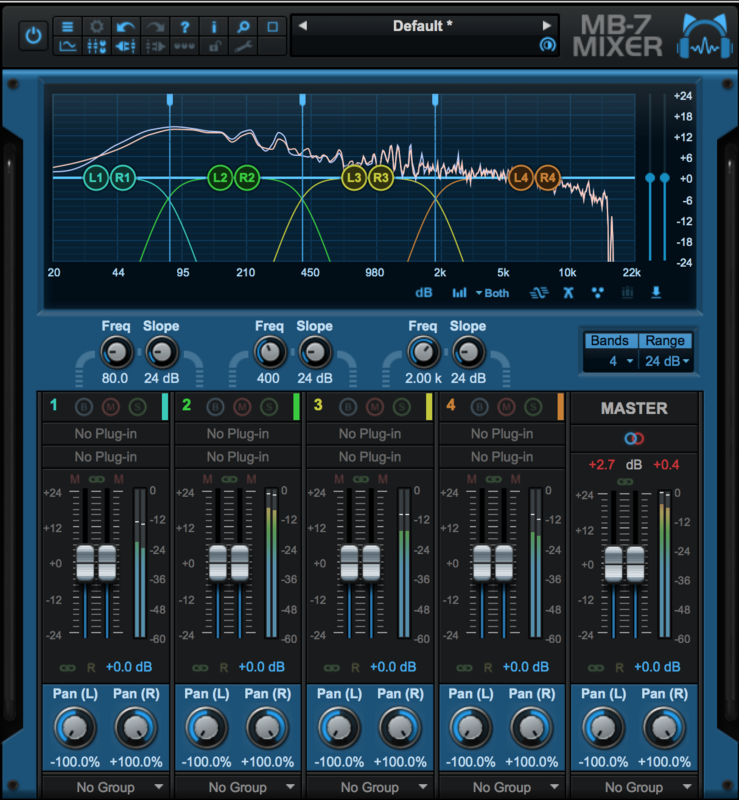 Remixers, Sound Designers and DJ’s should love this. Please note that I used loops of my own to test and didn’t dive into any of the available expansion bundles. Recording Engineer/Producer from 1970-2000. Digital Interface designer for Mackie Designs from 1998-2006. Digital Artist for Symetrix Inc. 2006-2017. 21 gold & platinum albums, and 2 Grammys somewhere along the way. 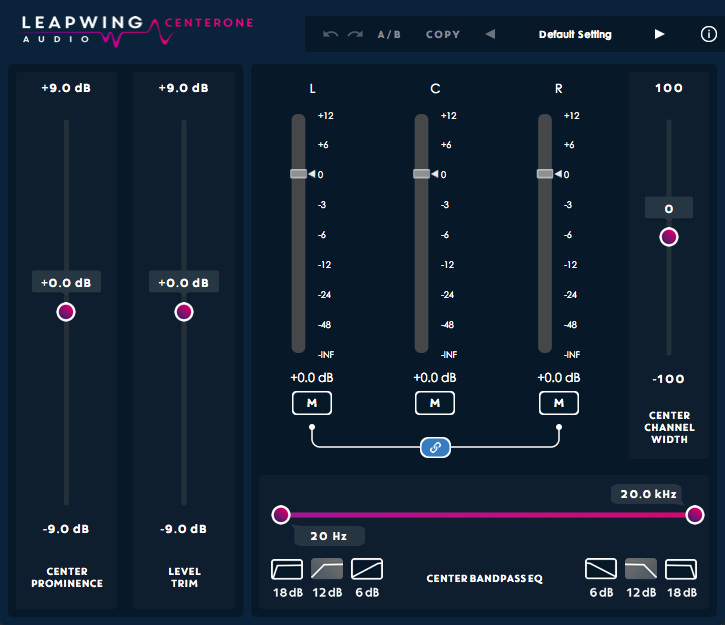 Lifelong Cubase user and a real stickler for reasonably designed plug-ins. Presently owner of Weasel-Boy Recording in Seattle. He's worked with Producers such as Amir Bayaan, Marley Marl, Bruce Forest and Arthur Baker. He's also worked with Artists such as New Kids on the Block, Madonna, LL Cool J, Stevie Winwood, Earth Wind and Fire, New Order, Prince and Jimmy Cliff.